As we went to bed last night we were looking forward to waking up to another rainy day. Instead we woke up to a foot of snow and a car that was completely encased in solid ice. Turning on the TV we were blasted with news of Snowmageddonpocalypse 2010! This has been standard for the past nine Nor'Easters which totaled more than 1.5 inches of snow. Information about this morning's unexpected accumulation would have been greatly handy last night when I could have set my alarm a half an hour earlier so that I could chisel and pry my car door open. 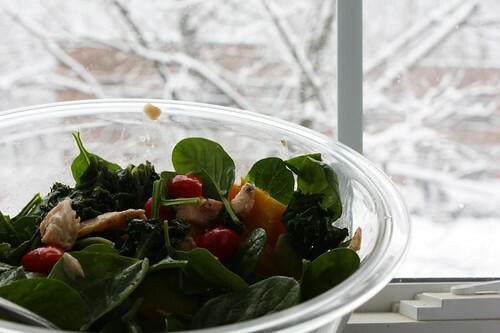 In the afternoon I enjoyed a leftover salad of spinach, kale, char, lemon, peppadew, olive oil, and golden beets. 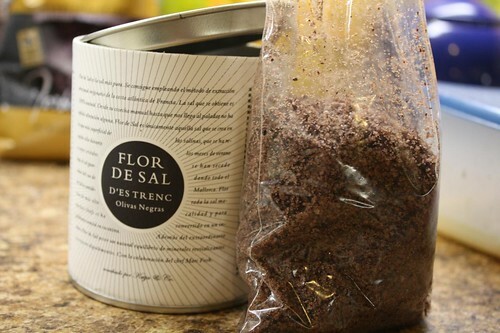 For dinner I started off by finding a use for the fourth in my series of fantastic sea salts from Gustomundial. 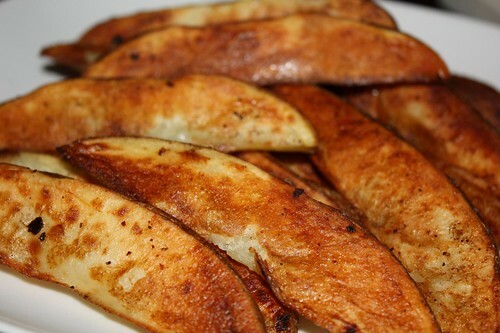 I tossed some potato wedges with olive oil, pepper, and the olive salt and roasted them at high heat until nice and golden. I find this salt is outstanding but probably better used in an uncooked state. Sprinkling additional salt on the potatoes after they came out of the oven seemed to work. I used a seasonal substitution for the traditional orange slice with Belgian beer by using these delicious Murcott Tangerines. 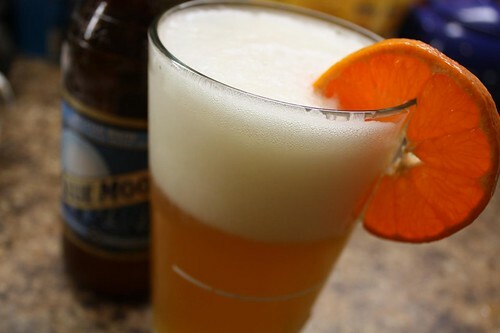 I also used a year-round substitution for Belgian beer with this Blue Moon. I cleared out a tremendous amount of items from the fridge by making this one pan roast with onion, garlic, and pepper. 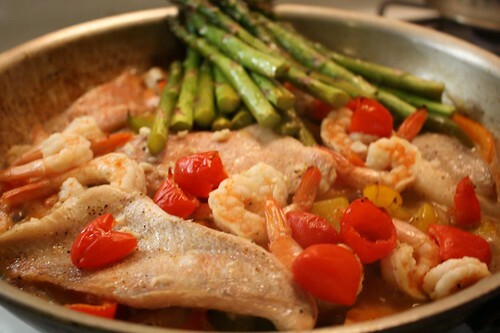 I marinated some perch fillets and shrimp with peppadews, lemon, and white wine which I roasted in the oven on top of the sauteed onion and pepper mixture. It was a relaxing snowy evening with friends, good food, and the soothing sound of a German slalom skier sobbing hysterically on a snowy mountain outside of Vancouver. What can I say? I love a sporting event where nations compete! It was a delicious meal for a snowy evening! Thanks again for having us!!! Jed, especially, had a blast and slept like a rock! We have that affect on people. Usually it's the adults who fall asleep!